It doesn’t really seem like there is much chance that the power brokers and downtown real estate moguls are much interested in saving the Fulton Fish Market – ever since all the commercial fish mongers/distributors moved to the Bronx it seem inevitable that the building would be torn down and some new soulless high-rise would replace it. Nonetheless it is admiral the work the New Amsterdam Market folk have done over the past few years to bring awareness to the need and demand for all year market. New Amsterdam Market’s only market of the summer will take place this Sunday, June 23, at the Old Fulton Fish Market. It’ll be one of our largest markets to date and will include a special Dairy Section featuring a Milk Bar serving egg creams, milkshakes, lassi, ice cream sodas, and other refreshments, and a Bread Pavilion featuring a variety of special loaves made by New York City bakers using regional flours. The full roster of vendors for Sunday’s market is available on our website. We’re excited to welcome back many of our long-term vendors, and thrilled to welcome a number of new small businesses and advocates to the market, including Amagansett Sea Salt, Brooklyn Seltzer Boys, Fresh Connections,Heritage Radio Network, Pistache, Red Hook Winery, Sip Soups, Sohha Greek Yogurt, Vermont Sail Freight Project and White Pike Whiskey. We’re also excited for a rare visit from Main Street Farm of Livingston Manor, who are bringing smoked weir-caught Delaware River eels. At 12 NOON, show your support for a revitalized public market system in New York and the preservation of irreplaceable public space at our Market Rally. Speakers will include Paul Greenberg, journalist and author of Four Fish and the forthcoming book, The Fish Next Door; Sam Simon, founder of Hudson Valley Fresh, and Roland Lewis, President and CEO of the Metropolitan Waterfront Alliance. 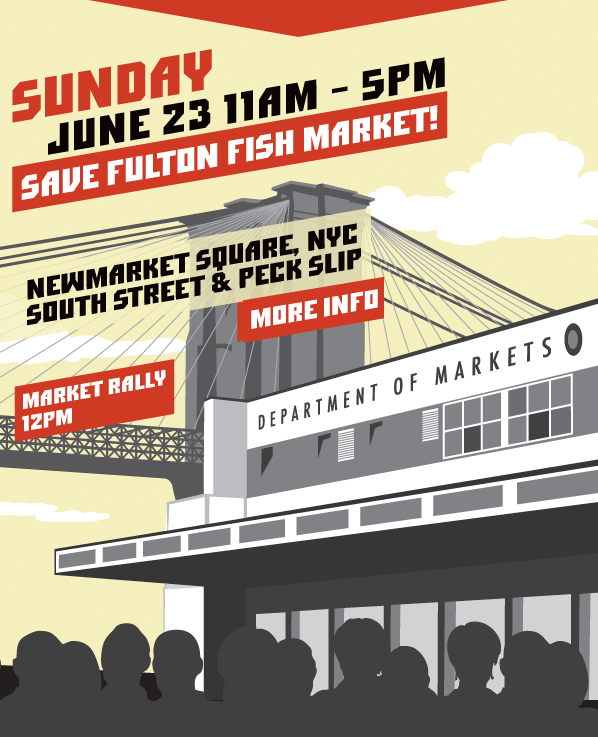 Please use the hashtag #savefultonfishmkt to spread the word! Two special walking tours of Lower Manhattan will make stops at New Amsterdam Market stalls this Sunday: the Culinary History Tour from Wall Street Walks will visit Spicy ‘n Sweet, Brooklyn Cured, and Liddabit Sweets; and the New York Waterfront Neighborhood Eats tour from Urban Oyster will stop for tastings with La Newyorkina and Runner & Stone Tartines. Visit each website for more information. We’re still looking for a few more Market Hands and Market Ambassadors to help with Sunday’s market. These are great opportunities for anyone interested in market operations or in helping our cause. Morning and afternoon shifts are available. To get involved, email Julie at volunteer@newamsterdammarket.org and include your name, contact info, and interest(s). This entry was posted in NYC, Politics and tagged Fulton street fish market, new amsterdam market, Rally, Summer Market, Urban Oyster, wall street walks. Bookmark the permalink.